Downtown, two mosques at the heart of the ‘old city’ are significant for their location and for their historical function (especially during the 1920s, ‘30s and ‘40s) as a conduit for Muslims from inland Chinese provinces who chose to set out on the hajj pilgrimage along the important seas-routes stretching from the international port of Shanghai. Chinese Muslims could not attend the hajj during the Cultural Revolution, but after 1979 organized groups were allowed to go and annual numbers now are in the tens of thousands. Of course few now go by sea. 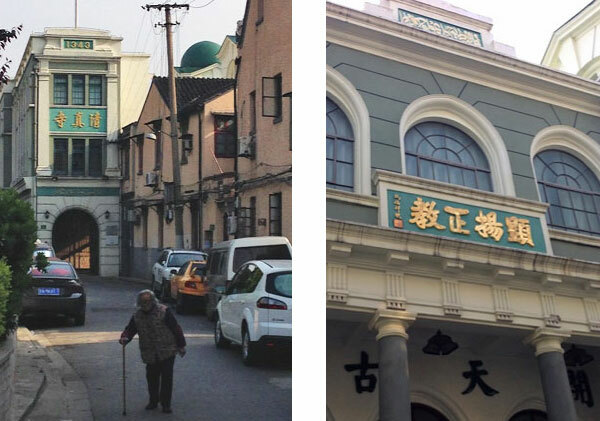 The first downtown mosque, Xiaotaoyuan Mosque (小桃园– literally ‘small peach orchard’), formerly known as the ‘West City Mosque,’ was built between 1917 and 1930. 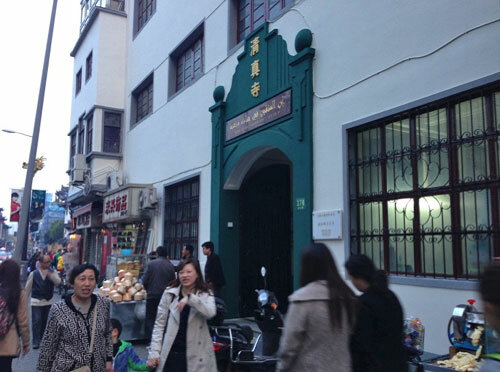 The adjacent ‘masjid for women’ (女寺), the only women’s mosque in Shanghai, moved many times over the course of the twentieth century, eventually merged with the Gaodun Jie Islamic Women’s school, and was finally rebuilt in this location in the 1990s before being given an additional spruce-up for the Shanghai Expo in 2010. Though you can almost look down upon them from the high ‘sky bridge’ (天桥) pedestrian road-crossings of a nearby junction, the domes of the mosques still stand out above the surrounding three-story longtang (弄堂) alleys and shikumen (石库门) ‘lane’ housing that dates from the same period. The buildings now count as heritage architecture, and are sign-posted as such. 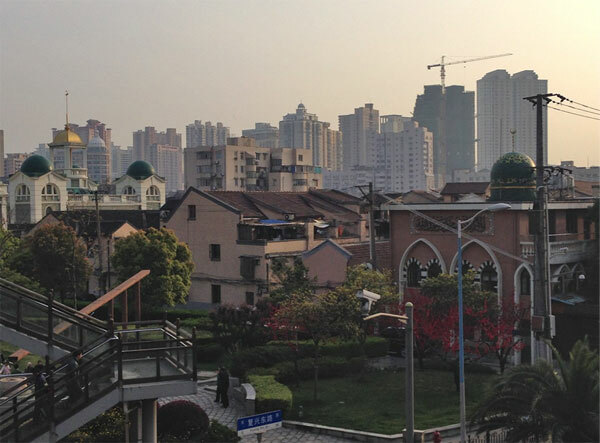 Not far from Shanghai’s famous Yiyuan gardens (豫园), the smaller Fuyou Rd (福佑路) Mosque, sometimes called the ‘North Mosque,’ also lies in the old city and dates to late nineteenth century Qing dynasty times. Today it boasts forty thousand Muslim visitors a year. 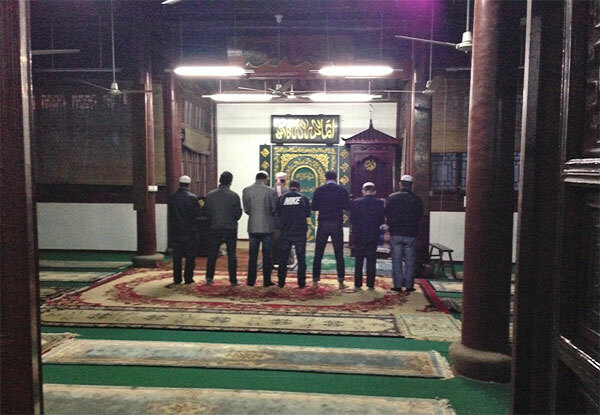 In April, just after sun-down, attendance for the 18:23 maghrib (昏礼) (fourth prayer session) is not huge however. A recording plays simultaneously in the small courtyard, but is not loud enough to drown out the sounds of a vendor of fresh coconuts (with straws) and multiple other reverberant sounds from the nearby street. 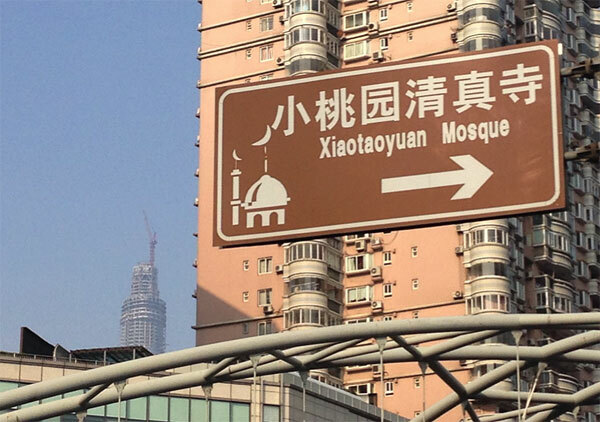 Imams in Shanghai universally make a point, given this history of visiting or transient religious populations, of paying little attention to whether worshippers belong to different denominations (教派) of Islam: they deliberately state that they welcome all-comers. 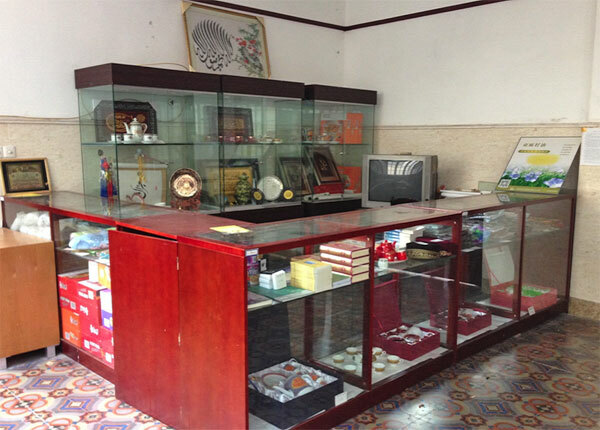 This is in stark contrast to the much more polarized situation in somewhere like Linxia, Gansu province, with a long history of subtle sectarian dispute.